These rats had drug-induced Type 1 diabetes. These results simply cannot be assumed to be relevant for Type 2 diabetes or gestational diabetes. The diseases can have near-identical outcomes, but from quite different underlying causes. These are rats. The drug that they used to induce the diabetes may not even produce diabetes in humans. So whatever the kombucha is doing here to reverse the impact of the diabetes might not be relevant to humans at all. Black tea and kombucha both acted to significantly improve the physical condition of the pancreases and the blood test results of diabetic rats. Researchers concluded that the most likely active ingredient of kombucha was the polyphenols, which are powerful antioxidants. Black tea also contains polyphenols but the fermentation of tea into kombucha increases the concentration and variety of them. Diabetes is a large and growing problem. Current medical approaches work up to a point but more efficient and cost-effective alternatives would be welcome. Probiotics in general are a promising source of new treatments for a variety of illnesses. Kombucha in particular has been shown to reduce cell damage by oxidative stress. Kombucha has also been reported to be a helpful supplement for cancer resistance, heart disease, digestive function, immune system stimulation and reducing inflammatory problems. Some of the effects reported for kombucha have also been reported for black tea. The researchers took some rats and injected half of them with a drug called Alloxan, which damages the pancreas and gives the rats Type 1 diabetes. Each set of rats were then divided into three groups: they all had free access to water and food; one set were also fed kombucha; another set were fed black tea. Thus, there were 6 groups of rats in the end – those with and without diabetes, each with kombucha, tea or just water. After 30 days, the rats were killed, and blood tests and microscope analysis of their pancreases were performed. The rats with diabetes who drank just water definitely had diabetes and were unwell. Both black tea and kombucha had a protective effect on the rats, but kombucha’s effect was significantly greater in each test. 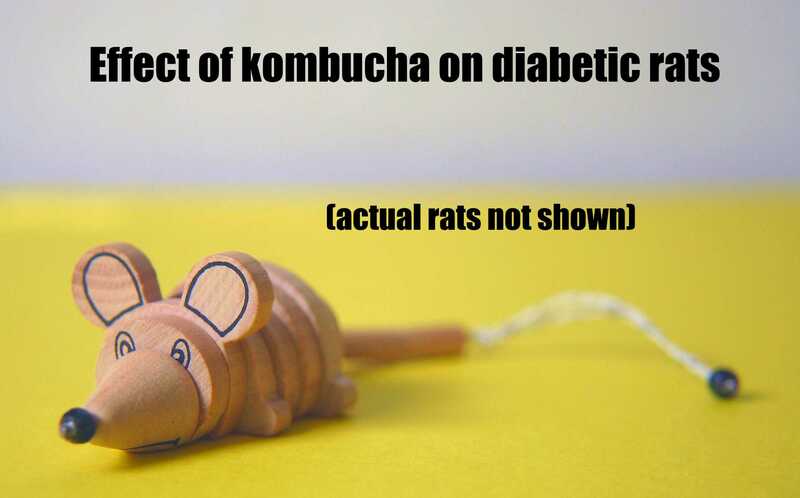 By some measures (for example, their blood glucose and triglyceride levels), the rats who drank kombucha had blood results almost the same as the rats who did not have diabetes. Three different blood tests were performed to measure liver function. The diabetic rats had impaired liver function according to all three tests. The rats who drank kombucha had improved test results for two of the three tests, but were still significantly impaired according to one measure. Two blood tests measured kidney function. Again, the diabetic rats had impaired function according to both tests. Kombucha provided such a protective effect that the diabetic rats who drank kombucha had results not significantly different to the healthy rats. You can see the difference between the healthy pancreas on the top left, and the diabetic pancreas on the top right. The black tea and kombucha tea pancreases on the bottom are clearly not as badly damaged as the diabetic pancreas. The effects of kombucha seen here are likely to be due to its high levels of polyphenols. Black tea also contains a good number of polyphenols, which have been shown to be responsible for its health-improving effects. Due to the fermenting action of the scoby, kombucha has a greater quantity and a wider variety of polyphenols than black tea. The highly antioxidant nature of kombucha is what the researchers credit with all of the above activities. Antioxidants have been shown in other research to have a protective effect on the liver and the kidneys, and also to protect against oxidative stress. The diabetes in these rats is produced by Alloxan – a drug that is rapidly absorbed by the pancreatic beta cells, where it turns into a free radical and kills them. Antioxidants counter the effect of free radicals. While these results look super promising, it is important to remember that one study is not enough information to draw any strong conclusions from. In particular, there are some issues with the diabetic rat model that we need to unpack a little bit here. Firstly, there are of course several types of diabetes, and several rat models exist for each of these types. In order to get meaningful results when investigating diabetes, a wide range of rat-diabetes models needs to be used. This is partly because each rat model only imperfectly mimics human diabetes. In today’s paper, the rats were injected with a drug that kills their pancreatic beta cells. It is perfectly reasonable to consider that the kombucha might have been protecting the beta cells from the actions of the drug. If so, then the kombucha didn’t really reverse the diabetes. It simply prevented the drug from damaging the pancreas in the first place. If this is the case, it would be completely pointless for a human to drink kombucha in order to treat standard Type 1 diabetes. People with type 1 diabetes have got completely dysfunctional pancreatic beta cells, and may never have had functioning ones. Likewise, a person with adult-onset type 1 diabetes has got an auto-immune disorder. Their immune system – not a free-radical-producing drug – is what is destroying their beta-cells. There is just not enough evidence from this study that kombucha will have any effect in that situation. Secondly, these are rats. While rat studies are really useful for testing substances to see how they act in a live animal, they don’t tell us how those substances will perform in a human. They can be useful in suggesting what might be the case, but it is a long way from being definitive. Having said all that, the one thing that I think we can take from this study is that kombucha has a lot of great antioxidants in it. In general, antioxidants are a good thing to drink because they reduce general oxidative stress in the body, nullify free-radicals, and are generally health-improving good guys. In short, despite my repeated cautions, I think this is a very exciting study. It is is a promising first step in researching the use of kombucha in treating diabetes and diabetes-related conditions, but it is only a very first step. This study would need to be repeated several times, with at least 3 or 4 different rat-diabetes models, for kombucha to be taken seriously as an anti-diabetes treatment. NB: No part of this site constitutes medical advice. See your doctor for all health concerns. Next Next post: Kombucha prevents kidney damage from an industrial solvent. In rats.